If you are a fan of urban fantasy – a rather specific sub-genre of ‘fantasy’ – then you will definitely want to check out this book, Urban Enemies, edited by Joseph Nassise. The premise of this collection of short stories is to have a story that focuses on the villains that have appeared either regularly or at least in some memorable fashion in an ongoing urban fantasy series. And what I learned is … I haven’t read enough urban fantasy series’. I have read some, though not all, of Jim Butcher’s Dresden Files series, and while I think Seanan McGuire is one of the best authors of fantasy currently writing, I can’t honestly say that I’ve read all the books in her October Daye series. Jonathan Maberry is the only other author in the collection whom I’ve read (and remembered) and liked his work, but I haven’t read ANY of his Joe Ledger books. The rest of these authors…? I recognize most of their names but I’ve never read any of these books. Perhaps that will change now. Not being familiar with these urban fantasy series means that reading a story featuring one of the villains means next to nothing for me, other than as a fantasy read. And as a series of fantasy short stories, every story in the book was entertaining and well-written. It is easy to see why each of these stories are a part of a larger, fictional universe. I enjoyed my time here and I wouldn’t mind reading any one of these series. However, I wasn’t so entranced with any one story that I made a conscious note to look for more books in the featured worlds. These were fun reads, but none of them sold me on wanting to read more. Looking for a good book? 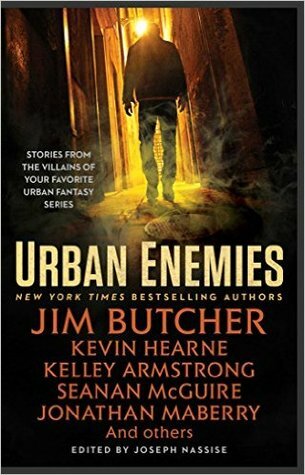 Urban Enemies is a collection of short stories featuring the villain in seventeen different urban fantasy series’. The stories are fun but would likely mean more to those already familiar with each series. I received a digital copy of this book from the publisher, through Negtalley, in exchange for an honest review.